I’ve seen 2D Cartoon Bags online for quite a while but always wondered where to get them. I know we can purchase them online but you know me, I don’t do online shopping. Last weekend, we were walking along The Curve’s street bazaar when I chanced upon these 2D Cartoon bags. I stopped immediately to have a look at them. I have no idea how much these are selling elsewhere as I’ve never bothered before. I told Darling I’m keen to get one but Ethan was making hell a lot of noise because he couldn’t stand the heat there! He was sweating and was rushing us like mad. I hate to shop when being rushed like that and even thought of leaving without purchasing anything but Darling said I should get one. Ethan deciding which bag I should get. The lady manning the store quoted us RM49 and refused to reduce a single cent saying that she originally sold them for RM69. I did not know then if it was reasonable or not. I wanted to Google the price but she was like getting impatient and that little boy was all covered with sweat by now. I tried bargaining yet she still refused to budge so Darling just paid the RM49 and off we go into the mall for the aircond! The 2D Cartoon bag of his choice for me. There, does it look cartoonish to you? If you are planning to get this bag, do not purchase it from the street bazaar in The Curve unless the lady boss agrees to sell them around RM35-RM38. I remembered how she vehemently refused to reduce a single cent claiming that she is selling it very, very CHEAP already yet everyone else is getting it much cheaper else where! So mummy Ethan use it or Ethan use it? I saw some a lot of young girls carrying such bag in shopping centres. It must be the trend now. 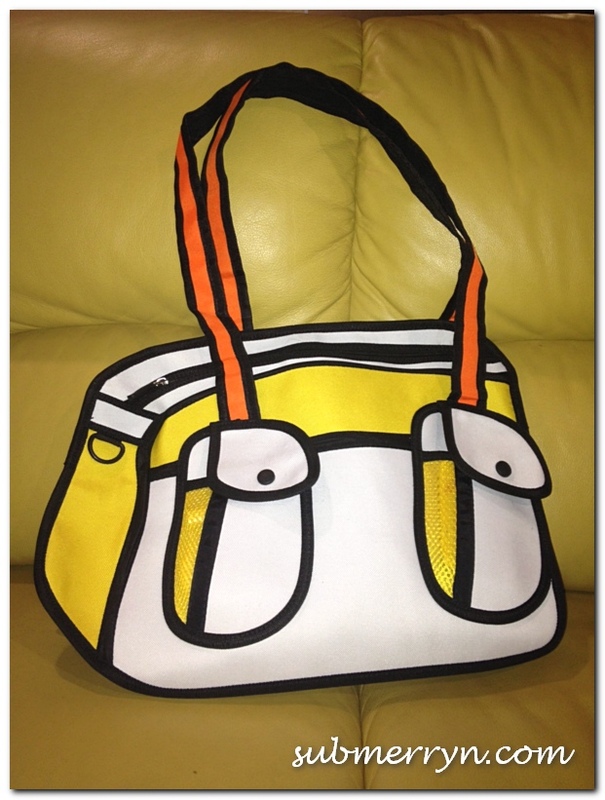 Wow..very trendy 2D bag. Love it! Yep, very cartoonish and cute!! Buying online need to pay shipping cost. It’s ok lah…the bag is so cute. This 2D bag is very cute. 2D bags look so fake yet so real, or vice versa LOL! Nice leh! ha ha ha, cute bag…..